It might seem as if scrap metal recycling is an easy job that requires no tools, but the truth is that scrapping is just like any other job: you’ve gotta have the right tools to get the job done. If you are going to get involved in recycling scrap metal in Massachusetts, you’re going to want to check out this list of must-have top tools for scrapping. Working with scrap metal can be hazardous if you aren’t careful. You want to avoid getting a lot of cuts and injuries, particularly from old or rusted metals. Leather work gloves are an absolute must to protect your hands from slivers and scrapes. This is perhaps one of the more important safety tips for working with scrap metal. You never know when a sliver of scrap metal is going to get in your eye. That being said, accidents happen on any job, but when you are dealing with multiple types of metal from many different locations as you gather it for recycling, it’s always good to be prepared for anything. Scrap metal recycling in Wareham is no different than anywhere else – you’ve got to protect your eyes. You might think that because you are working for yourself that you can get by with wearing tennis shoes or whatever else you want to wear. While there are no rules or laws requiring it, you should still wear heavy duty work boots with thick soles. When recycling scrap metal in Massachusetts or anywhere else in the country, chances are you will be stepping on a lot of sharp metal fragments, nails and screws as you go about your business. While clothing isn’t necessarily considered safety equipment or work tools, in this case having long pants and long sleeve shirts – even in the summer – is highly recommended. Again, the goal here is to protect yourself from slivers that can come from breaking down metals for transport or recycling. Now that you are dressed and aware of the safety issues and tips for working with scrap metal, its time to identify the number one tool that every scrapper should have in their arsenal: a magnet. The first test you should ever perform to find out what type of scrap metal you are dealing with is the magnet test. If the scrap metal draws the magnet it is ferrous metal, which is anything that contains iron. If it doesn’t draw the magnet then it could very well be a valuable piece of non-ferrous metal. Many times metal is coated or plated and must be filed down to be tested. One example of this would be to check flatware that is silver plated to find out what kind of metal is underneath. Knowing if you have brass or copper rather than some kind of ferrous metal will make all the difference in the value of the item. This is why a file is one of the top tools for scrapping – something you should keep with you every time you are collecting scrap metals. Great to have on hand to remove cords from scrapped appliances or other things. Wire cutters are also essential if you need to remove the insulation or plastic from some items as well. It’s good to have things handy that can help you break down the pieces you collect before taking them in to sell. There are a myriad of other tools that you should have in your toolbox when recycling scrap metal in Massachusetts. Crowbars, knives, hammers, drills, ratchets and even bolt cutters can really come in handy when you need to break items down for recycling. Bolt cutters will be used frequently to cut the copper tubing out of scrapped appliances and to remove valves from plumbing. While these won’t fit in your toolbox, you will want to get a variety of different containers in your workshop or storage space to help you categorize your findings. Separate aluminum cans from aluminum siding and other types of aluminum products. Keep copper tubing, wires and parts collected from scrapped appliances separate as well. You will see a difference in the way your items are processed at the scrap yard when you take care of these details in separation. If you don’t want to get into too much detail, at least take the time to separate the ferrous metals from the non-ferrous before you get to the scrap yard. Some scrap yards will take plastic items, but it’s always a good idea to remove any plastic, wood, glass or other non-metal parts from scrapped appliances. Make sure to take your time and watch out for hazardous chemicals or other components to appliances, such as coils or pumps from air-conditioners or refrigerators. Ask your local scrap yard if they accept plastic or glass and find out if they have any preferences for recycling these items. 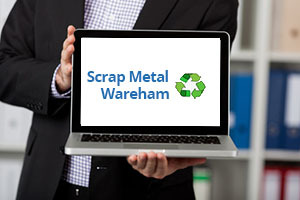 If you live in Wareham or the surrounding area, you can take your scrap metal to Mid-City Scrap Iron & Salvage, which is located in Westport, just south of the I-195 on State Road. Mid-City has been in business for over 80 years and has the capacity to process scrap metals for use by manufacturing companies, giving you access to fair market rates for your scrap metals. Call Mid-City or browse the website for more information about how to get the best prices for your copper, aluminum, stainless steel and other metals in Southeastern Massachusetts.